Any walking tour of New York lets you see just how much Polycor, the largest producer of natural stone in North America, has its imprint on the commercial and cultural buildings, the cathedrals, and so many of the other buildings that make New York, New York. Limestone quarries in southern Indiana have provided the stone for an amazing number of the US’s most noted monuments and buildings. Included among them is New York’s most famous structure, and long one of its tallest buildings; The Empire State Building is composed of 200,000 cubic feet of Indiana limestone, from the Empire Quarry in Bloomington. The 102-story Art Deco building, designed by Shreve, Lamb & Harmon, was completed in 1931. Despite being the epic project of its day, the stonework used provided a lesson in American efficiency when building the Empire State building. The stonework was prepared off-site, then delivered, ready to be inserted into place by workers. The most iconic limestone in America became part of Polycor’s portfolio when Indiana Limestone and Polycor merged in 2018. Today highest level extraction techniques are allowing Indiana Limestone to quarry more than 2 million cubic feet of high-quality limestone per year for public buildings and private residences. About a mile up 5th Avenue Saint Patrick’s Cathedral soars in all its decorated Gothic Revival glory amidst the generally more angular surrounding office buildings. The Cathedral was designed by James Renwick Jr. and William Rodrigue. Its cornerstone was laid in 1858 and construction lasted another twenty years. Much has been written about its gothic style features- it’s pointed and ribbed arches, the buttress piers, and stained glass. The stories behind its exterior are lesser known: The church was originally constructed with white marble from the now closed Tuckahoe quarry in Westchester, New York. In 2012, a restoration of the cathedral began, a project that would last three years. MBB architects, who oversaw the extensive clean up and repair, turned to the historic Tate quarry in Georgia, known for its beautiful quality Pearl Grey marble. The clear white Carrara-like marble with light grey veining was selected for the restoration as the characteristics, veining, and coloration seamlessly matched the original. The restoration project’s completion was timed for the arrival of Pope Francis’ 2015 visit. In fact, it was completed ahead of schedule; the domestic marble was key in preventing typical delays that come with importing stones from abroad. More on the Saint Patrick’s restoration here. Just a few blocks south on 42nd Street is the magnificent Beaux Arts building that is Grand Central Terminal. In the 1970s, the landmark building, designed by Reed & Stem and Warren & Wetmore in 1903, and ten years in the making, was marked for demolition. Public figures including Jacqueline Kennedy Onassis stepped in to save it. The railway station had its heyday in the thirties and forties, but at as the jet age took over, rail travel fell into decline, and no one thought an old railway station would be much missed. But it endures as a crucial part of New York’s aesthetic and historic identity. The ingenuity of the architects and the quality of the stone were a good match when it was originally chosen. The architects wanted a stone that was cost effective, while also withstanding the ages and recalling classic architecture. How they became sure that the creamy white Indian Limestone they chose was the one, is one of NYC's great insider stories: In 1905, the architects sourced stone from 15 different quarries – everything from granite, limestone and marble – and fashioned them into small monoliths to serve as test panels. They wanted to see how each stone would withstand winter in New York. The monoliths were placed in Van Cortlandt Park in the Bronx. They became known as the Grand Central Monoliths and are still standing today. 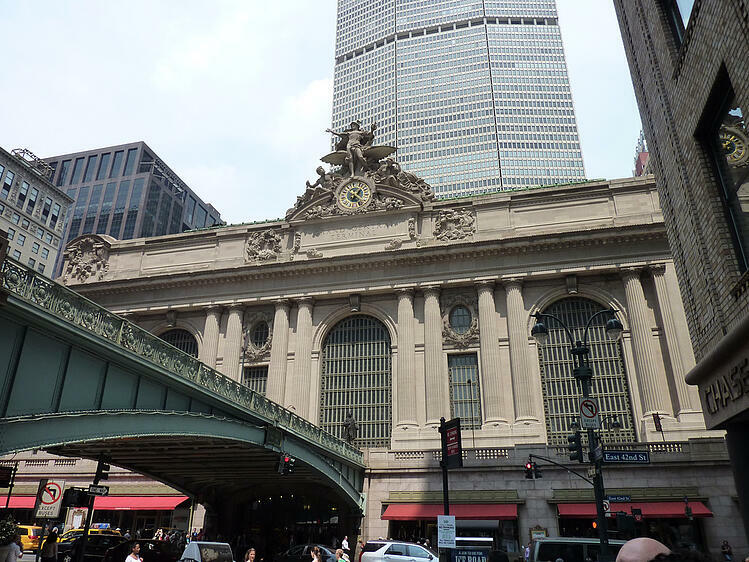 The longevity of the Indiana Limestone has helped preserve Grand Central for the ages. In fact, Grand Central was declared a national historic monument in a Supreme Court decision. And the ornate building with its sculptures and murals is one of New York's greatest tourist attractions today. But after close to a century it needed a good clean up. A decade long upgrade inside and out was completed in 2004. Like a Renaissance painting that has been restored, the cleanup revealed the buildings original color. Years of residue from pollutants had greyed the original facade, but the cleaning revealed an untarnished Indiana limestone. Head further up midtown to West 53rd and you’ll find The Museum of Modern Art. The sculpture garden here was purposely designed as an extension of the original 1939 museum building designed by Philip Goodwin and Edward Durell Stone. Philip Johnson designed the white marble garden in 1964, and called it “an outdoor room.” Indeed, the garden is as welcoming to art lovers, as to people just looking for a lovely, quiet place to sit in the middle of the day in the thrum of midtown. (The garden is often jokingly referred to as Manhattan’s nicest lunchroom.) In 2004, Yoshio Taniguchi & Associates renovated and expanded the sculpture garden. Taniguchi envisioned the garden as the lungs of the museum, an airy space that provides views from each of the surrounding buildings. He required natural material that would be equally airy and welcoming, but sturdy enough for the weight of the heavy sculptures, and ideal for a high traffic exterior. The architect selected Polycor Pearl Grey Georgia Marble for the pavers and the bridge over the water. The stones were all cut from the same blocks in the quarry; thicker slabs were cut for the steps and the bridge to support loads of pedestrians, and the stones were honed for suitable slip resistance. See more of the MOMA sculpture garden here. Five blocks north on Central Park South at 59th and 5th Avenues is the GM Building, perhaps best known now for the famous Apple Glass Cube in front of it. Until recently it had long been on its own one of the most recognizable commercial buildings in midtown New York, and it’s one of the finest expressions of the clean-cut verticality of a New York skyscraper. The 50-story white monolith in the International Style, was designed between 1964 and 1968 by Edward Durell Stone and Emery Roth & Sons. Both architectural firms were known as prolific skyscraper designers who have left their mark on New York City’s skyline. The facade is formed by piers of Polycor’s White Cherokee marble slabs and punctuated with black glass bays between. The glistening white marble from Georgia’s marble quarry was a natural choice for its strength and durability. The hundreds of thousands of square feet of the beautiful marble are intrinsic to the building’s distinctive architectural style. Just one block south is an example of how luxury brands use American marble - the Louis Vuitton Building, partially hidden by a curtain wall of glass. Clad entirely in White Cherokee marble, the building features modern and classical architectural elements including carved sculptures at the tiers of the tower and a modern frosted glass facade feature that extends five stories up from the street at the front of the building and then wraps the corner of the building and continues up six more stories to the first tier. Head all the way downtown into the heart of the financial district and you will find The New York Stock Exchange building on Wall Street. Designed by George B. Post in 1903 the solid Neo-Classical style the exterior incorporates all the style’s features such as symmetry, columns, and a pediment with marble sculptures by John Quincy Adams Ward entitled “Integrity Protecting the Works of Man.” Post conceived the theme and hired Ward, a well known sculptor to execute the allegory, which visitors and locals alike delight in trying to decipher. Beautiful White Georgia marble from the Tate quarry covers the facade of the Stock Exchange, making it seem even more like a Greek marble temple for Wall Street's bulls and bears. An architect could spend a busman’s holiday walking through New York, admiring buildings made from American natural stone and appreciating the design and craftsmanship of the architects and stone professionals who created them. The city that never sleeps may never rest its head but it’s feet are firmly planted in American natural stone. See more iconic architectural projects made with American marble. Download the lookbook.